Revenue management focuses especially on short and long term profit maximization and is an essential tool for hotels to make profit. On the contrary, customer relationships management (CRM) focuses on a long term relationship with the customer in order to increase the profit no matter how much revenue is going to be generated. The purpose of revenue management is “to maximize revenue and ultimately profit through improving sales” and the revenue manager has to set the right prices in order to sell the maximum of rooms at the highest price the customer is willing to pay. This is done by “increasing the operating efficiency and effective management of three main areas: pricing, inventory control and costumer mix or market segment. The least understood aspect of RM appears to be the need to devise business policies and procedures as a precursor to gathering the information needed for accurate forecasting, and then the continued enforcement of them as necessary ingredients of the constant refinement of inputs needed for successful RM. In addition, the sheer volume of data that needs to be processed and the difference in the optimization algorithms from company to company requires the extensive use of computers and specific mathematical skills. As such, few hospitality companies have the internal resources to develop effective revenue management programs on their own. CRM is a relatively new business strategy that has its roots in sales force automation and has been enabled largely by advances in and the decreasing cost of information technology. Given the relative newness of CRM, citing a traditional definition is difficult. 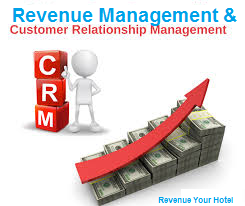 Customer Relationship Management (CRM) is a strategy used to manage the hotel’s interaction with customers. Its goal is to find, attract, win customers and retain a good relationship with them. According to CRM Guru.com, “CRM is a customer-centric business strategy; which dictates re-designing of functional activities; drives re-engineering of work processes; and which requires CRM technology to implement.” In essence, CRM is about enabling customers to have what they want, when they want it and how they want it; it is about identifying, retaining and growing a company’s most valuable customers. While the concept of CRM may be simple, the implementation of a comprehensive CRM strategy is not. To begin, effective CRM requires a complete change in most companies’ strategic orientation from a product to customer focus. This usually requires not only substantial investments in technology to enable the identification and tracking of customers but also a reengineering of business processes to enable the delivery of products and services tailored to the needs of specific customers. The adoption of CRM in the hospitality industry has been impeded by a number of factors. These include the persistently fragmented nature of the industry, the disparate, proprietary and relatively immature nature of IT systems, and the additional complexity associated with managing a perishable product that is sold through a variety of distribution channels. However, more rapid progress is being made due in part to the continued consolidation between hospitality companies and hospitality IT vendors. Based on many researches have been done in the marketing field on the customer relationships management. CRM “has a strong focus on the management and development of profitable customer relationships. The implementation of CRM activities generates better firm performances when managers focus on examining the value of customer. Maintaining a good relation with a good customer is another way to maximize profit for the hotels because they provide services and have a strong incentive to satisfy their customer. This is why it is difficult to imagine how could a hotel making profit without considering CRM. Both RevM and CRM have an influence on profit maximization but work in a different way with different objectives. Revenue management allows the hotels to maximize their revenue but few researches have been done on its effects on costumer relationship. In fact, RevM implies customer conflicts. It can be view as unfair by customers. For instance they may ask “why people who stay at identical hotel room sizes end up paying different prices ? If the hotel does not set a loyalty program, it may happen that loyal customers find out that others pay less because they booked earlier or later and never book a room in the same hotel anymore. Using revenue management, hotels maximize their profit and increase their revenue in short term but might lose some clients, and not perform in the long term if they under evaluate the customer relationships management. Studying hotel revenue management and making a link with customer relationship management is important in order to find solutions to overcome the potential managerial conflict that can appear between both. These both practices are significant to lead to the financial success of the hotel and this is why it is really important to understand how the organization can influence the impacts that RevM can have on costumers and to not neglect these effects. There is a gap in research on this topic and the study could participate to extend the research that has been done until now. Using a multiple case study based on interviews, it will be possible to have a direct contact with the managers and get better and wider information about the subject. There are a variety of scenarios in which revenue is not maximized due to either short-term revenue enhancement at the expense of customer-specific data or vice versa. And yet, for the most part this is the state of the industry. There are both business and technical issues to be overcome. Nonetheless, as RM and CRM become more widely accepted and less expensive, traditional RM concepts will be merged with those of CRM, one-to-one marketing and business intelligence to create even greater revenue maximization. The benefits associated with doing this should outweigh the costs – especially if the blending of the two strategies is undertaken at the outset.